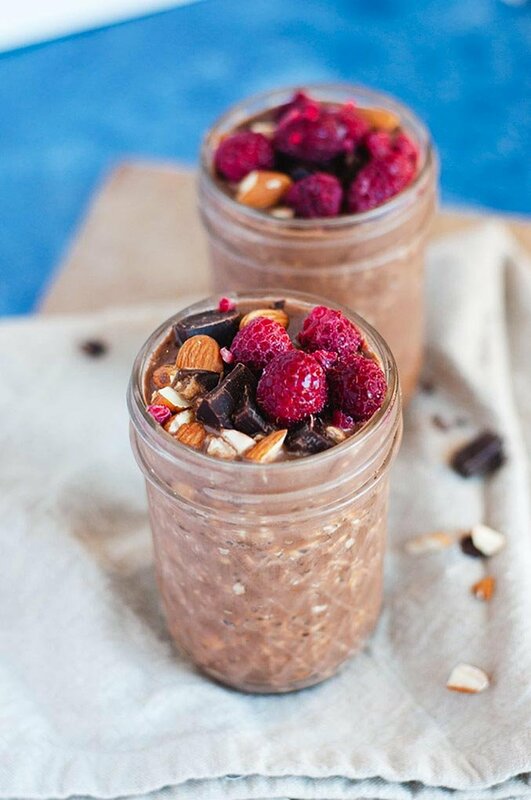 These mocha flavored overnight oats are everything a chocolate lovin’, coffee drinkin’ personal could ever ask for! These oats are sure to fill you up and wake you up. My go-to “fancy” coffee drink is a mocha, which is basically just hot chocolate with espresso. 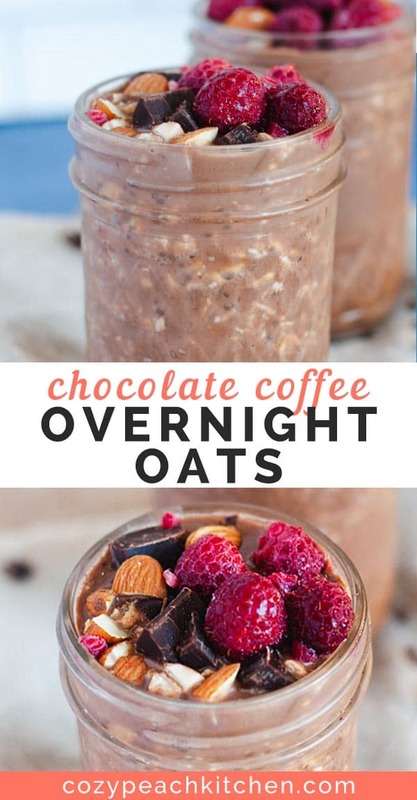 This oatmeal is an easy way to enjoy a cozy mocha and filling, healthy breakfast, with minimal added sugars! 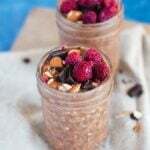 Overnight oats are one of my favorite breakfast recipes. 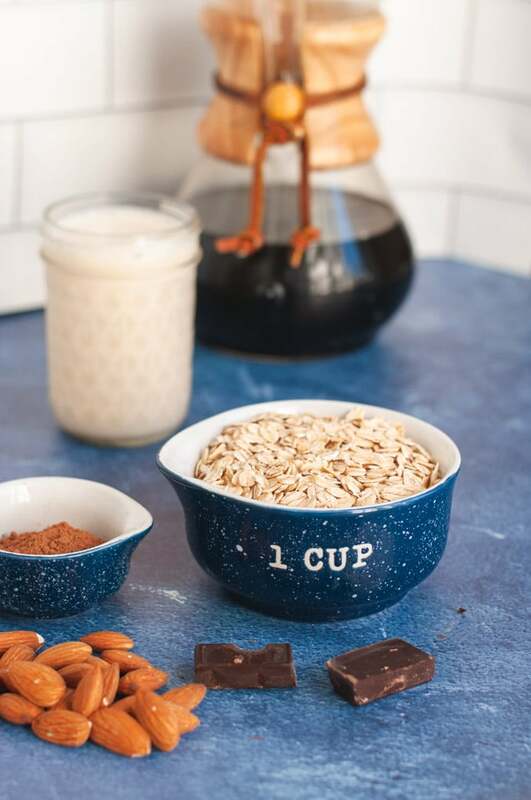 Just mix together a few healthy, common ingredients in a bowl and by the next morning (or within a few hours) you’ll have a creamy, filling breakfast or snack. Coffee. Use your favorite kind of hot brewed coffee or cold brew. 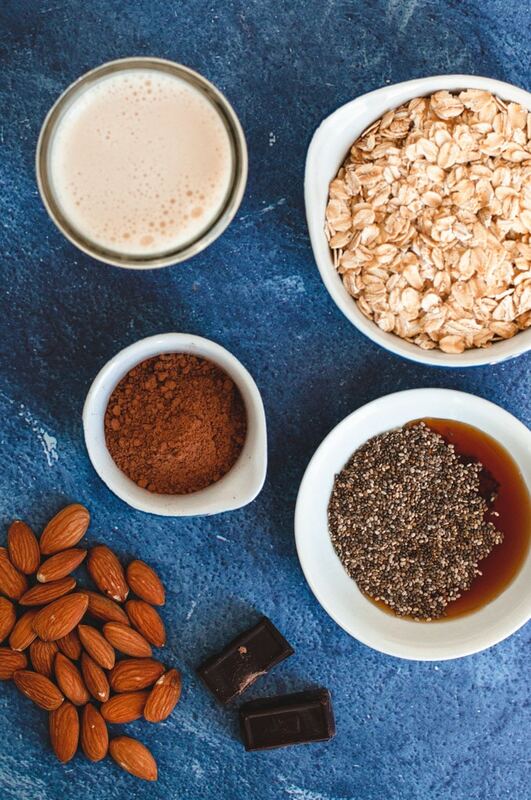 The temperature of the coffee doesn’t matter, but the hot coffee will make the overnight oats ready more quickly. Old-fashioned oats. Also known as rolled oats, this whole grain gets soft and creamy after refrigerating overnight. Cocoa powder. Combining cocoa powder with milk and coffee pretty much just makes chocolate milk. Yum! Sweetener. A liquid sweetener like maple syrup, honey or agave syrup mixes best. Milk of choice. Soy milk, almond milk, or any other milk you have on hand will work here. Toppings. 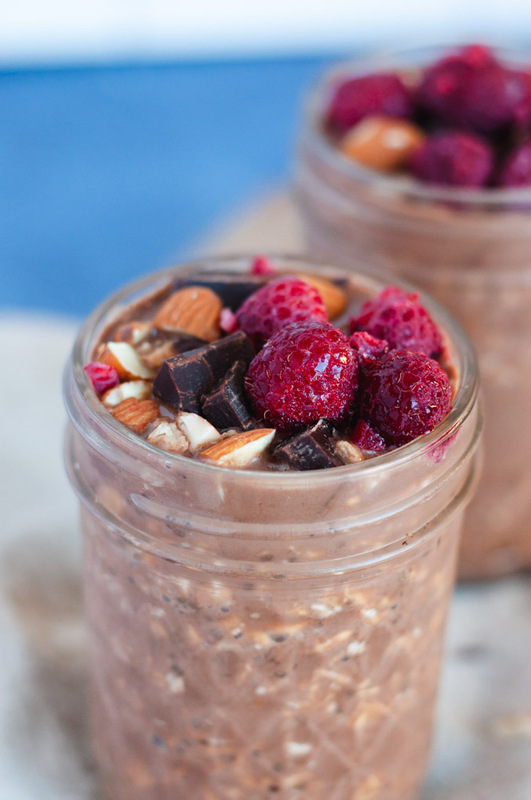 Fresh raspberries or strawberries paired with sliced almonds and these chocolate overnight oats is a match made in heaven. Add chia or flax seeds for additional fiber. A dash of salt. Using just a small amount of salt enhances the sweetness of these overnight oats. Brew 1 cup of coffee or you can use cold brewed coffee. Mix together the dry rolled oats, cocoa powder, and salt in a medium mixing bowl or large ball jar. Pour in the milk, coffee, and sweetener. Mix until combined. Let rest overnight or for at least 3 hours before enjoying. Top with 2 tablespoons of chopped nuts and 1/4 cup fresh fruit for a well-balanced breakfast. Pro tip: Heat up your overnight oats in a saucepan for quick stove-top oatmeal. The result is creamy, hot oatmeal in just a few minutes! 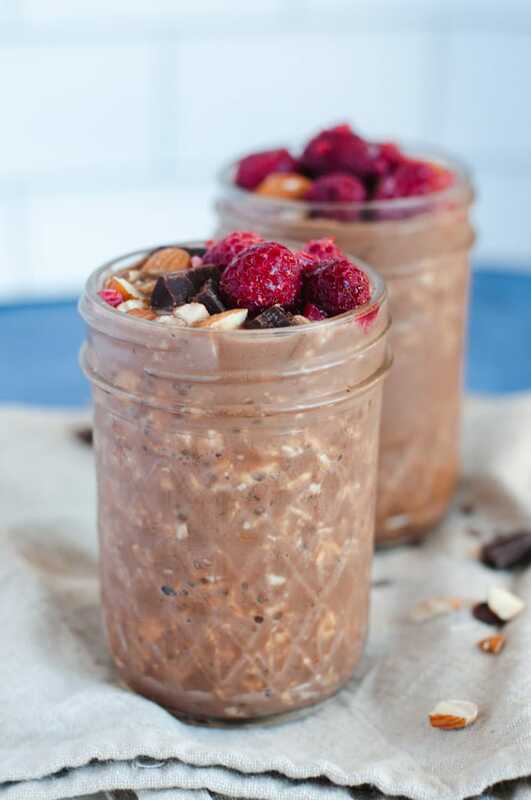 This recipe yields two servings of chocolate coffee overnight oats, but you can easily double it for a week of meal prep breakfast. 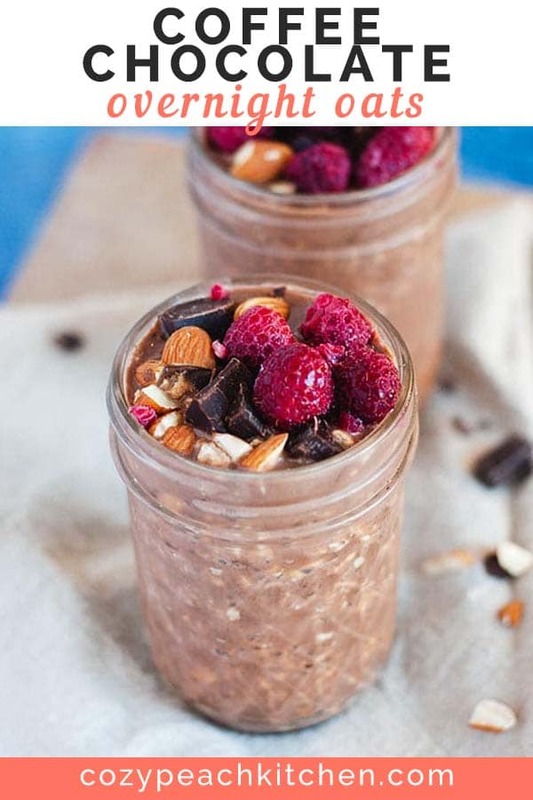 Mocha style overnight oats are perfect for meal prep breakfast or as a healthy dessert. Stir together the oats, cocoa powder and salt in a medium bowl or large jar until the oats are fully coated in cocoa powder. Stir in the remaining ingredients. Cover and refrigerate overnight, or for at least 3 hours. Enjoy topped with fresh fruit, chopped almonds, and bittersweet chocolate.